The results came in on Groundhog Day and it seems as if spring has already arrived. 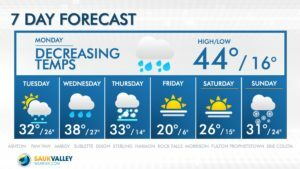 Even though Punxsutawney Phil predicted an early spring, we still have a little bit of wintry weather ahead. So put the brakes on, because we are about to head into an active pattern through the week ahead. Tonight we will continue with warmer temperatures than the last, allowing the snowpack to continue melting. Temperatures through the night will continue to rise to the mid 40s by the predawn hours Monday. Some drizzle will persist through the overnight hours into the morning along with periods of dense fog. After seeing much of our snowpack melt over these last 36 hours, let us not get too comfortable with the current trends. As mentioned, wintry weather is ahead, and this week will be quite active with a few disturbances set to press through the Midwest. We have been monitoring a minor disturbance that will pass through our region Tuesday night through Wednesday morning. With this, cold air has been favored to remain to our north along with warmer temperatures to our south. Model guidance has continued to show us receiving higher chances for a wintry mix of sleet and freezing rain. However, a chance will exist for minor accumulating snowfall. 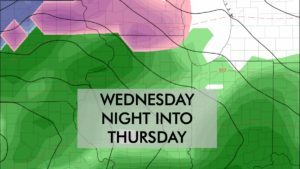 This system will likely impact your morning commute on Wednesday. 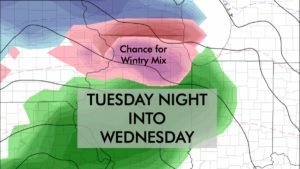 After Tuesday night’s disturbance, we then again introduce a chance for a larger system that could move through the Midwest and our local area as early as Wednesday night. Unfortunately, we can’t give too much detail on this system yet as it is quite a few days out, and model guidance continues to shift how this upper level low will track through the Midwest and timing. Even with an active pattern ahead, we will experience warmer temperatures than last week presented us. Monday we will begin to see an entrance for our wintry week ahead. Temperatures Monday are forecast to decrease through the day dropping into the mid 30s by the evening commute. 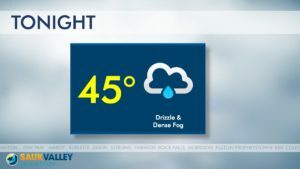 Rain and fog will likely be present Monday morning.